Allowing only 39 rushing yards to an offense led by Jamaal Charles, sacking Alex Smith 6 times, winning the turnover battle and converting 50% of their 3rd downs meant the Steelers beat the KC Chiefs and have locked a ticket to the Playoffs for the first time since 2011. The Steelers can end no worse than the 5th seed. In fact, if the Steelers win against the Bengals, they’ll be AFC’s #3 seed (thanks to the Colt’s loss at Cowboys). Next week’s game vs Cincinatti has been flexed to primetime (which gives the Steelers a league high 6 primetime games this season). The Steelers are 4-1 on primetime games in 2014 (their only loss at Baltimore, week 2, with wins at Carolina, vs Houston, vs Baltimore and at Tennessee). Blake breaks up TD pass. With the Score tied 3-3, and the Chiefs had just converted a 4th down on a trick play to get a 1st and goal at the Steelers 6 yard line. On 2nd and goal from the Steelers 4 yard line, Alex Smith threw a perfect pass to Bowe, who appeared to have a great chance to catch it and put his team 10-3, but A. Blake broke up that pass. Next play, Worilds sacked Smith for a 3 yard loss, forcing KC to settle for a FG, making it 6-3 and keeping it a low-scoring, close game. Big stop on 4th down. On a questionable play call by Andy Reid, the Chiefs went for it on 4th and 1 from the Steelers 12 yard line with 27 seconds left in the 1st half. Lawrence Timmons and James Harrison stopped Charles at the line of scrimmage, negating a score by the Chiefs, keeping it 10-6, Steelers, going into halftime. Tuitt’s forced fumble. Score 10-6, Steelers. After exchanging punts to open the 2nd half, the Chiefs drove 44 yards to the Steelers 28 yard line on what appeared to be a scoring drive. On 2nd and 7 from the Steelers 28, Smith found Charles open, who caught a short pass and was fighting for extra yardage, when Tuitt delivered a big hit on Charles, forcing a fumble (that V. Williams recovered). Roethlisberger’s TD pass to Brown. After that fumble recovery, the Steelers drove 72 yards to the Chiefs 3 yardline. With the scoreboard still 10-6 in the 3rd quarter, Ben Roethlisberger found A. Brown for his only TD pass of the game, just after being tripped and before being knocked down by the Chiefs pressure. His patience with the football gave Brown enough time to find an opening, and Ben delivered a perfect bullet to Brown, who made it 17-6 with 40 seconds left in the 3rd quarter. Offense: The Steelers had just 6 offensive drives all game long, and scored on 4 of them, being able to put 20 points on the board while gaining 282 total yards. Let’s not forget they were facing KC’s defense, ranked 3rd in scoring in the NFL. Even though Ben had a low yardage game for his 2014 standards (220 yards), he didn’t throw for an interception for the 3rd consecutive game and had 1 TD pass (to Brown), on a play in which he was unintentionally tripped (really? ), and being patient to find him open in the End Zone. Could have had three more TD passes, but drops from AB and Miller negated a couple more for him, while he underthrew a relatively open Palmer in the end zone. He wasn’t erratic often, didn’t force throws into double coverage and was able to find both, Miller and Brown, 7 times each to move the football, while contributions by Wheaton (2 catches for first downs) and Bryant (on a 44 yard reception) helped to establish scoring drives. He didn’t take a step back after being hit, while being able to move the football and convert 3rd downs throwing during the 4th quarter. 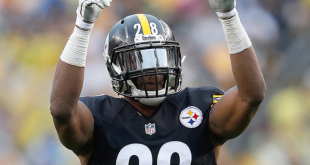 Statistically, Bell had a subpar game with 72 total yards (63 rushing with a 3.1 average), but he still was a big factor while getting 5 first downs and a rushing TD, also being able to put some good blocks on pass protection, helping the OL keep Ben clean. 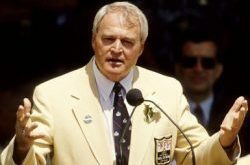 Once again, no other halfback carried the football for the Steelers. Wide receivers accounted for more than 53% of the Steelers total offense, with Martavis Bryant accounting for 53 yards on consecutive plays in the 1st drive (44 yard catch, 9 yard run), Wheaton grabbed two catches (both good for first downs), and Antonio Brown grabbing 7 passes and a TD. Going to Bryant on 3rd and 4 in the first series was a smart call, which showed they both have a good tempo on that go route. Brown, even when double covered, finds a way to get open and that was a key factor to let the Steelers move the football between the 20s. Miller was a factor too, grabbing 7 passes, with 4 of them being good for first downs. Spaeth was deactivated, and Palmer played on his #2 TE spot, being targeted just once on an underthrow by Ben. Miller has been getting more and more involved as the season unfolds, which is good news facing the season finale and playoffs, giving Ben another reliable target, besides his young WRs and elusive RB. Offensive Line allowed Ben to establish his passing game, but once again struggled to open lanes for Bell. Of 52 total offensive plays, only 1 was for negative yardage (Houston’s sack of Roethlisberger) and the OL deserves credit for it. Still, Bell was able to convert 5 rushing first downs, score a rushing TD behind DeCastro and Gilbert, and Ben was given enough time to throw for most of the game. Foster committed a 15 yard penalty after one of Suisham’s FGs, forcing the Steelers to kick from their own 20 yard line, and giving KC Great field position to start what became a FG scoring drive. Poe and Houston weren’t big factors for most of the game, and that’s to be credited to the Steelers OL, too. Defense: 6 sacks, fumble recovery, 3rd & 4th down stops, limit the Chiefs to 39 rushing yards: no TDs allowed. The Steelers Defense stopped KC’s offense on 4 drives inside the Steelers Red Zone (KCs offense was ranked #2 in red zone efficiency in the NFL, before the game), who had to settle for Field Goals three times, while stopping them on 4th down, right before halftime, on the other one. Front 7: Allowing 39 rushing yards from a Chiefs offense featuring Jamaal Charles, and getting 6 sacks. Tuitt recorded his 1st sack and a forced fumble, while Heyward had 1.5 sacks and several hurries. If they continue to play like this, Heyward and Tuitt have the potential to become anchors of the defense. Today, they did an Aaron Smith-Brett Kiesel impression. Timmons and Harrison combined to stop Charles on 4th and 1 from the Steelers 12 yardline, negating a score to the Chiefs on what became a turning point for the game (instead of heading 10-9 to halftime, when the Chiefs would receive the 2nd half kickoff, they kept It 10-6, and stopped KC’s first drive in the 2nd half). Worilds and Harrison combined for 3.5 sacks, and both of them had big stops on running plays. Harrison had his best performance as a Steeler since 2012. He faced a former #1 overall draft pick in LT Eric Fisher, and abused him frequently. Timmons had another great performance, with huge stops on 3rd down (one of them, negated by a very questionable –at least- call by the referee on William Gay, for taunting –on his own teammate? Really?). A shorthanded secondary, playing without Polamalu (Will Allen took his place) and Ike Taylor (who I wonder, if healthy, if he’s still the starter) allowed KC to pass for more than 300 yards, most of them on short routes (longest pass was a short catch and run). Credit to Blake, for breaking up what could have been a go ahead TD to Bowe, to Will Allen, who was frequently tackling close to the line of scrimmage, and to the DBs as a unit, keeping the ball in front of them and not allowing the big play. While 312 yards from Alex Smith sound like being torched, most of them were on scheme: short passes and bubble screens were frequently used, while the Steelers secondary was showing respect to their WR corp, playing with enough separation to let that happen. Wing punted just two times, one of them an extremely short 34 yarder, and a long 56 yarder, providing no consistency (which was an issue at the start of the season). Suisham converted two short FGs (both from 23 yards). The kick block unit was caught off guard on a 4th down trick play, which allowed KC to get a first down. The Steelers didn’t allow big returns from KC, which was good news, keeping the Chiefs away from starting their drives with good field position. And with a legitimate shot at #3, all the Steelers have to do is win their season finale. And then, most probably, play host to an AFC North foe in the Wild Card round. Losses against 3-12 Jets and 2-13 Buccaneers are the difference between facing season finale playing for #3 seed, and for #1 seed. Credit to DBs for not allowing Chiefs’ WRs to score their 1st TD of the Season. Since 1950, no team has gone an entire season without their WRs scoring a TD. Honestly, the Steelers DBs provided a good chance to be the first ones to allow it. Great call, first series long pass to Bryant. Like that approach, and both showed great tempo, again. While I like what Bell brings to the table, Harris should be getting some reps. It won’t happen while games are on the line, but the Steelers have no proven backup behind him. Playing January football means it’s pretty relevant to have a 2nd running back, especially when playing in the elements (if the Steelers win out and go through the SB, their path could be: at Heinz Field season finale, at Heinz Field Wild Card round, at Denver for the Divisional Playoff game, and at Foxboro for Division Championship). Why isn’t Shamarko Thomas getting reps? With Polamalu sidelined, it was supposed to be his turn. Will Allen made some plays, but he’s not the future at the position. Shamarko should be. Any chance Harrison thinks twice after the season about retirement? Interesting story about his kids not letting him come back, just to listen to one of them say “I didn’t say so”. And how can that effect decision time with Worilds next season? Tuitt needed a chance to grow while getting reps. This kid will make things happen (he’s already moving that way). And next week could be the last regular Season game in Heinz Field as a Steeler for… Troy Polamalu? How much credit does our Defense deserve? While the Defense recently locked games against Jacksonville (scoring a TD on a low-scoring, close game) and Atlanta (stopping them on the 4th quarter), this game against KC could be seen as the best Defensive performance so far this season. At least, league-wide it’s been pointed as an exception performance. How about remembering how they set the tone against Carolina, Houston, Indianapolis, Baltimore, Tennessee, Cincinnati and Atlanta (early, on Gay’s pick six)? Weren’t those good, tone-setting performances from the defense, too? Memo to Colbert: Time to open the wallet and think about Heyward’s extension. Underrated, and flying under the radar, A. Blake and McCain have made several plays on defense this season. Is Cortez Allen now expendable? And what about Ike? Not that they seem to be the future at the position (Blake and McCain), but could pretty much complement with Gay and draft picks to replace former starters Taylor and C Allen. Who will cover AJ Green next week? Gay, Blake or McCain? All three seem an upgrade from what Taylor did (or did not) against him the last time the Steelers faced him. Another heavy dose of 3-7 counter on the Bengals, probable? Last time, it accounted for 100 yards. If the Bengals adjust, it could open up the playaction game, once again. Two very questionable judgment calls from the referees: One call, a taunting penalty on Gay, which kept a Chiefs drive alive, and a non-call on what was a clear tripping penalty on Ben’s TD pass to Brown. Coach Tomlin has shown his emotions recently, and was really fired up after Gay’s penalty. Also, after the Steelers recovered the final onside kick, he was jubilant on the sidelines. That attitude makes me wonder if he thought he’d be on the hot seat if not getting into the playoffs. An AFC North rematch looks probable: If the Steelers finish as a Wild Card, it means Cincinatti will be #4, hosting the Steelers. If the Steelers win the Division as #3, they could be receiving either Baltimore or Cincinnati. 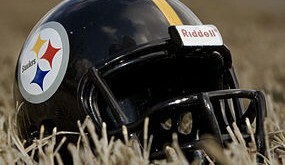 Regular Season finale at Heinz Field, a flexed primetime game vs the Bengals, Sunday December 28th. If the Steelers win or tie, they’ll be Divison Champs and AFC #3 seed. If they lose, they’ll be in as a Wild Card, no worse than #5 AFC seed. Current record on primetime games this season: Steelers 4-1, Bengals 1-2. 6 Sacks by the Steelers defense, Season high (and most since December 23, 2013). 11 times the Steelers have scored 20 points this Season. 17 Steelers NFL rank in Penalties, after leading the league for the first stretch of the season. 365 passing yards needed by Roethlisberger on season finale to surpass 5,000 (only 5 QBs in NFL history have accomplished that: Manning, Brees, Brady, Marino and Stafford).